The Ghosts of Ohio T-Shirt Contest! It’s that time of year again: I’m gearing up to hit the road with The Ghosts of Ohio on our fall tour—giving presentations and making appearances all across the state. If you’re planning on coming out to one of our gatherings, don’t forget to bring along your camera. That’s because all you need to do is snap a photo of The Ghosts of Ohio and you might win a limited-edition shirt! • Come on out and see The Ghosts of Ohio at any of their fall presentations and appearances (visit ghostsofohio.org for a full list of dates and times). • Take some pictures of The Ghosts of Ohio. These can be posed or action shots. Heck, we don’t even need to be in the picture—snap a shot of our booth or logo. Be as creative as you want! Just please don’t go hunting us down in our hotel rooms! • Upload your photos to The Ghosts of Ohio’s Facebook Wall, making sure to name the event in the caption and, above all, tag yourself in the photo to ensure we know it’s yours! • You can post as many photos as you’d like, but only 5 photos per venue/appearance will be entered in the contest. 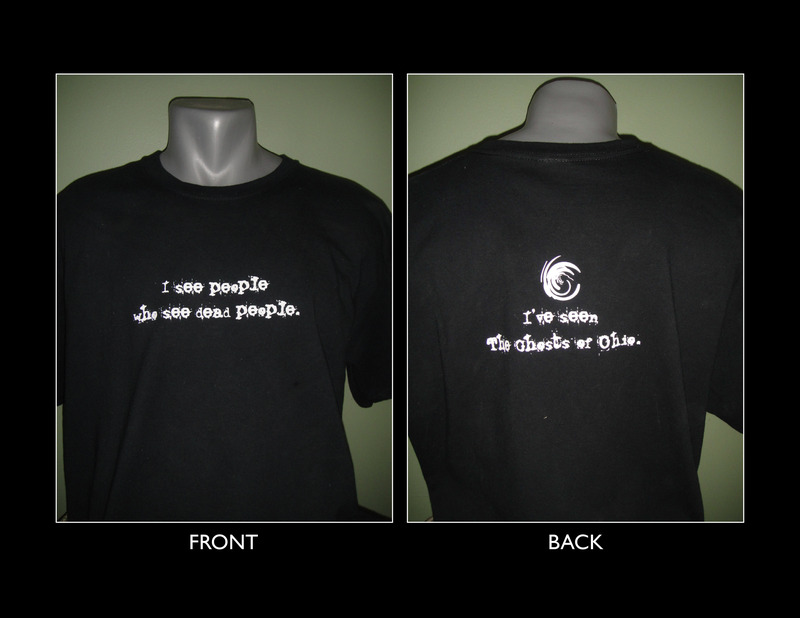 • Cross your fingers that you are one of the 5 lucky winners chosen at random to receive your very own limited-edition “I see people who see dead people” shirt! And now for all the fun disclaimer stuff: Contest opens at 12:01 am on Monday, October 3, 2011, and closes at 12:01 am on Monday, November 7, 2011. Winners will be chosen at random on Saturday, November 12, 2011, and their names posted the week of November 14, 2011. Shirts will be mailed out at that time. Any questions? Send them to info@ghostsofohio.org. Unless otherwise noted (by a $ symbol), all presentations are free and open to the general public. Seating is often limited, so please call the venue beforehand to reserve your seats.